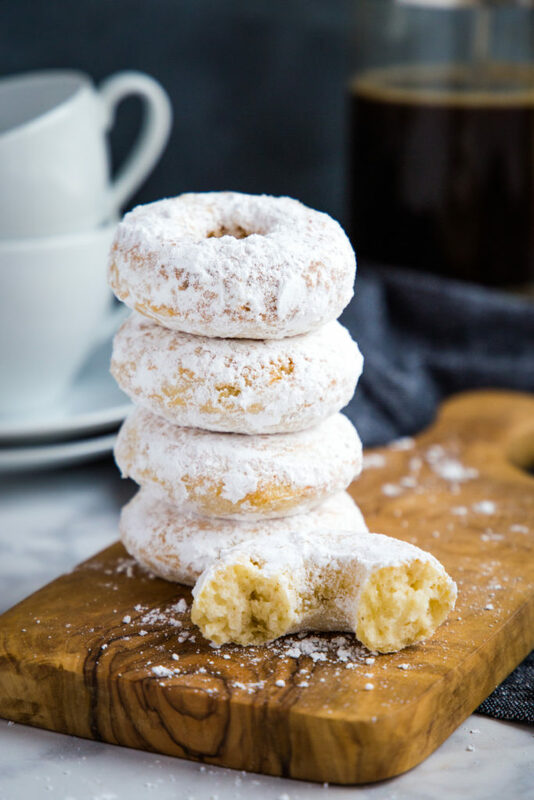 Donuts are a huge weakness for me – thankfully I’m about an hour’s drive from the nearest donut shop and about an 8-hour flight away from the nearest Tim Horton’s (if you’re not Canadian, you might not know what that is – it’s almost every Canadian’s favourite coffee and donut joint!). 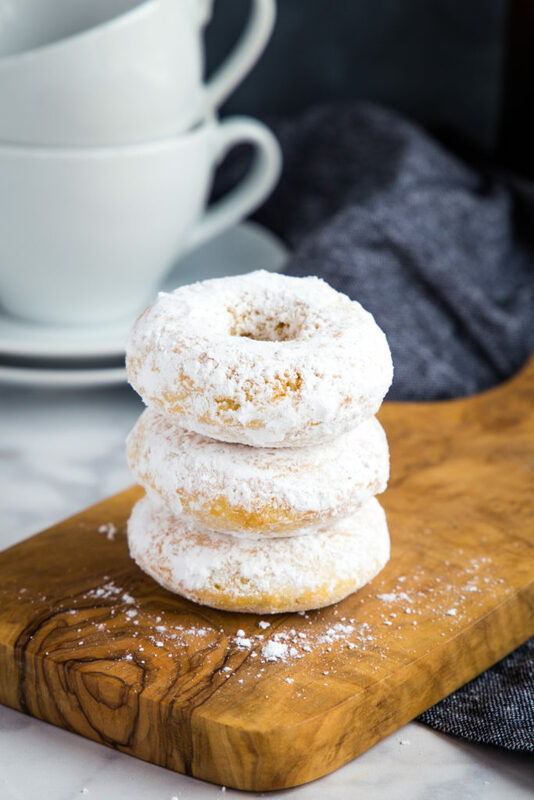 Making donuts at home is a MUCH healthier way to enjoy these sweet treats and my latest favourite homemade donut recipe is these Old Fashioned Powdered Sugar Donuts – they’re under 100 calories per donut!! 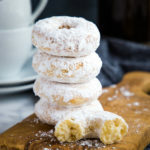 You will need a donut pan for this Old Fashioned Powdered Sugar Donuts recipe, and if you don’t have one already I’d definitely recommend this Wilton Medium Donut Pan (affiliate link). 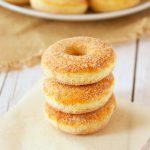 It’s the perfect size for this recipe that yeilds 24 medium-sized donuts and it’s non-stick and easy to clean. And it works best when you grease it with a little bit of oil or butter. I always use my Misto Oil Sprayer for this job (affiliate link) because it allows you to achieve the same effect as conventional oil sprays while using a healthy oil and without all those harmful propellants found in conventional oil sprays. Don’t overmix your batter! Mix gently and just until the flour disappears! Use a piping bag! Fill a large piping bag with your batter, snip off the tip of the piping bag and pipe your donuts into the donut pan! Don’t overfill your donut pan! Fill the cavities about 1/2 to 2/3 full and no more than this! Don’t overfill, or your donuts won’t have the cute little hole in the middle! Spray with vegetable oil spray! 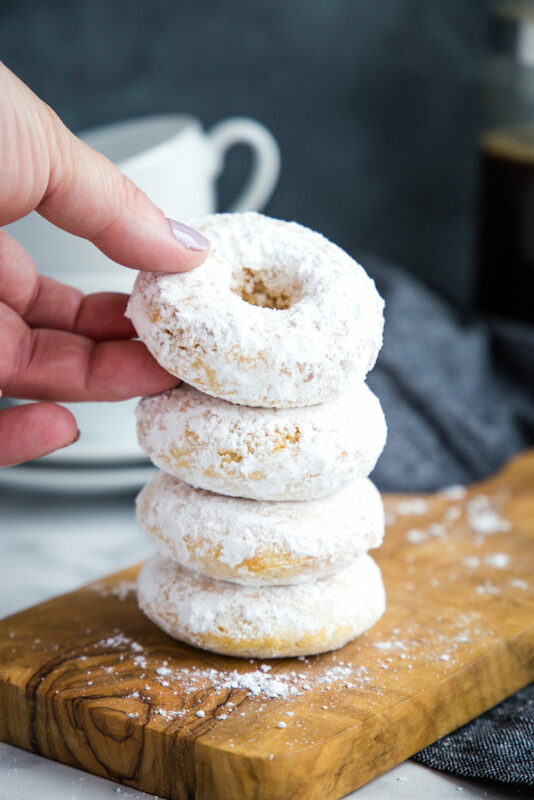 If you’re finding the powdered sugar doesn’t want to stick, give each donut a tiny little spritz of vegetable oil spray and that’ll do the trick! 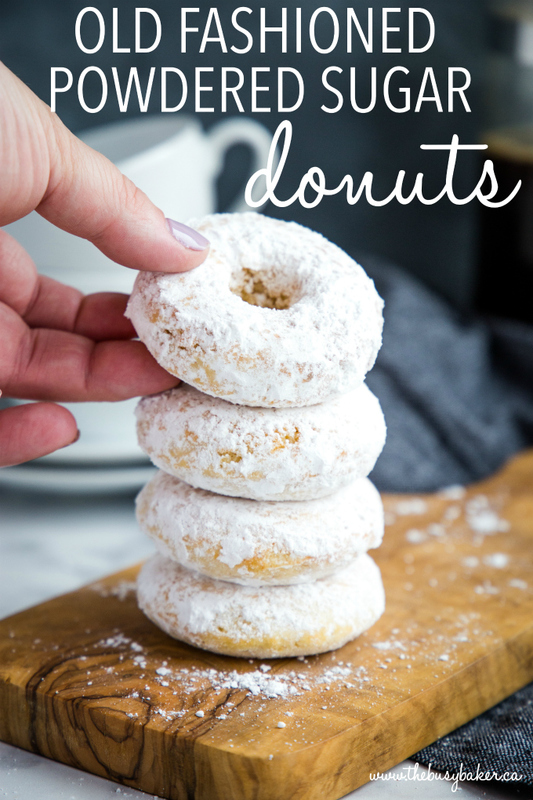 I hope you love these Old Fashioned Powdered Sugar Donuts as much as we do! Let me know in the comments below, what’s your favourite coffee shop treat? I’d love to know! 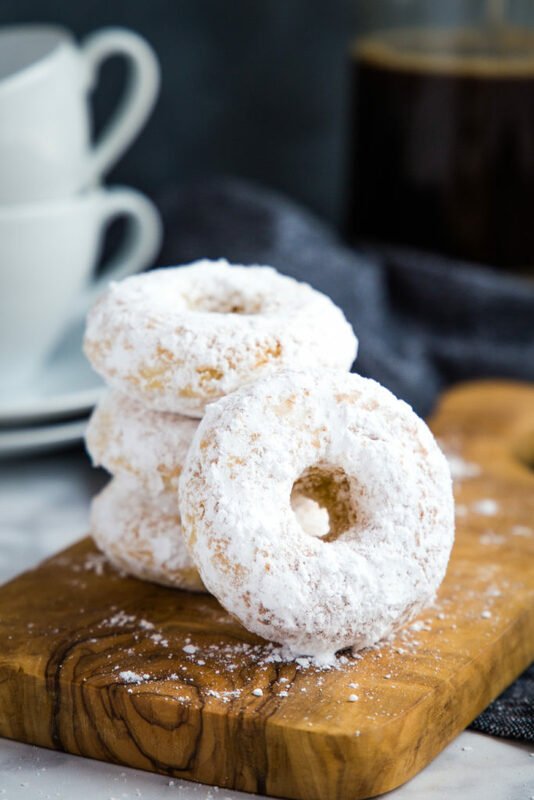 These Old Fashioned Powdered Sugar Donuts are a delicious treat that's easy to make and much lower in fat than coffee shop donuts! Preheat your oven to 400 degrees Fahrenheit. Grease a medium 12-donut donut pan with vegetable oil cooking spray or butter and set aside. In a large bowl, whisk together the flour, sugar, baking powder, cinnamon, nutmeg and salt. 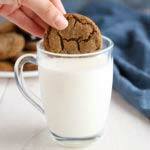 In a glass measuring cup, measure the buttermilk. Add the eggs and vegetable oil to the buttermilk and whisk with a fork to combine and break up the eggs. Add the wet ingredients to the dry ingredients and mix together gently with a rubber spatula just until any streaks of flour disappear. Over-mixing can make the donuts tough and rubbery, so mix gently and only as much as you need to. Add the batter to a large piping bag and pipe the donuts into the donut pan cavities only about 1/2 to 2/3 full. Bake at 400 degrees Fahrenheit for about 7-9 minutes, or until the donuts are just golden brown on top and lose their shine. Cool in the donut pan for about 5 minutes before removing to a wire rack to cool completely. 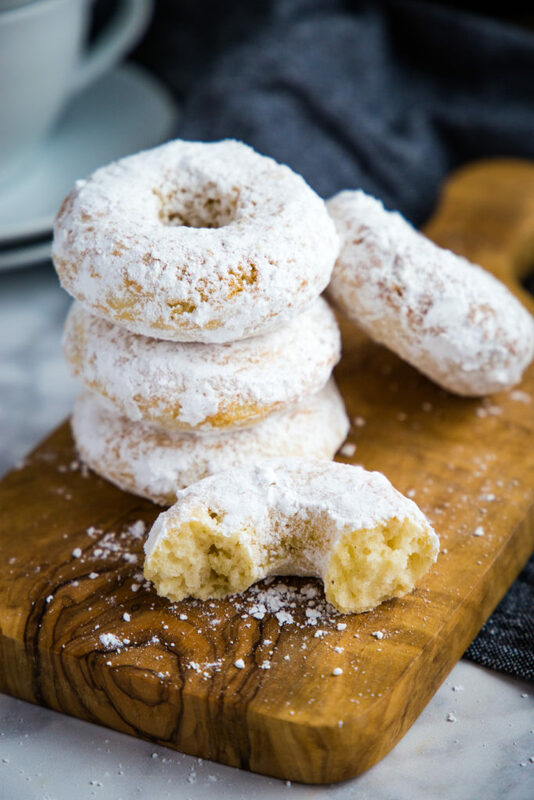 Once cooled, dip the donuts in powdered sugar (use a light spritz of vegetable oil spray on the donuts if the powdered sugar needs help sticking!) and enjoy! Store these donuts in an airtight container for up to 3 days. They are best enjoyed fresh! 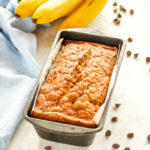 Can we skip White sugar in the batter and use non fat milk instead of butter milk? 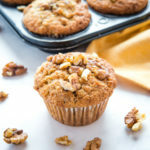 Mmmm, these look SO good, I can’t wait to try them! These are my son’s favorite donuts and it’s his birthday next week, so I’m going to surprise him with these. Thanks!! What a wonderful way to start my day! These are delicious! When I was little, my mom and I would open a pack of powdered donuts at the beginning of our grocery shopping (in the store). By the time we got to the check out stand, the donuts would be gone, and we would hand the checker the empty wrapper to scan. Powdered donuts will always remind me of my mom. You brought back some wonderful memories this morning – thank you for that! Anything with powdered sugar is good in my book. I will have to make these for the kiddos, so I don’t have to buy the bagged one at the store. These look so good that I just ordered 3-8 donut hole pans just to bake them in! I can tell by the ingredients that we’re gonna love these, and the calories? A donut for less than 100 calories??? OH yeah, we’re gonna love these!!! Thanks for another great recipe! 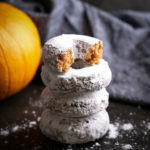 I liked the sound of this recipe so much that I actually ordered 3 silicon donut pans (8 donuts per pan) just so I could try this recipe! I was not disappointed! 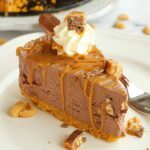 OMG, these are delicious, the hubby and I have been racing each other back to the kitchen to snag another one! 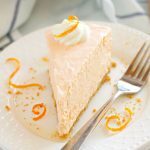 Thanks so much for yet another great recipe! So glad you enjoyed them!! Thanks for taking the time to leave a comment!